I’ve been researching technology on a philosophical level and came across this TED talk by Kevin Kelly. Kelly is an editor at WIRED magazine, but more relevant to this conversation, he was the founder of the Whole Earth Catalog. The WEC was originally published in printed form, but quickly moved online when the Internet became a thing, and was concerned with various DIY, counterculture, or pro-environment product reviews and essays. It never actually succeeded in containing the whole Earth, but as a sort of philosophical precursor to the World Wide Web it encouraged sharing, openness and democracy (that the Internet is any of these things is a myth [possible paywall], but that’s another discussion). Some interesting takeaways from this talk are how Kelly equates technology’s evolution to biological evolution. Tech, like biology, moves toward diversity and complexity.He even goes so far as to name technology the Earth’s 7th kingdom (the official six kingdoms are plants, animals, fungi, protists, archaebacteria, and eubacteria). Richard Dawkins’ The Selfish Gene posits that the idea that genes have a “selfishness” to them in that they look out for their own best interests, and technology could be seen to have that same selfishness; It wants to proliferate. Technology cannot be destroyed, only slowed down. Everything from a random page in a mail-order catalog from a hundred years ago is still available today in some form or another. To conclude, Kelly suggests we have a moral obligation to continue advancing and creating new technologies because it allows humans to reveal their best qualities (also worst, but again that’s another discussion). Imagine Van Gogh without the invention of oil paint, or Hitchcock without the invention of film. Where would our culture be without technological progress? We’ve cooled considerably in our technological optimism in the past several decades; we’re a long way from viewing human progress through the rose-colored glasses represented by Walt Disney’s ever hopeful and wondrous Carousel of Progress. And that makes me a little sad. Speaking of Disney, I remember growing up in the 1980s and visiting Epcot for the first time. I couldn’t wait for the future of automated home and robot butlers. Well, now I have Nest and Hue to automate my home, and Roomba to vacuum my floors. So now what do I look forward to? Thanks to Wasfi for taking notes during our 3D-scanning introductory meeting. I’ve expanded a couple things and added some more resources that I’m aware of. High quality connections or just using the software used to make it for scanning will help with resolution. EDGE Magazine — The grade is not the end. We’ve been having some exciting meetings about EDGE, the upcoming online undergraduate research magazine. It isn’t planned to launch until next fall, but meanwhile we’re building the framework and experimenting with website structure and formatting. We want to make it as easy as possible for students and faculty to present work, and we want to make it as visually appealing as well. Since I’m in charge of creative aspects, I’m looking into ways to have student input into the visual elements, for example having a logo that changes frequently (like the Google Doodles) and is submitted by students, and a resource of student-submitted stock photography or illustrated ledes (the header image for an article). 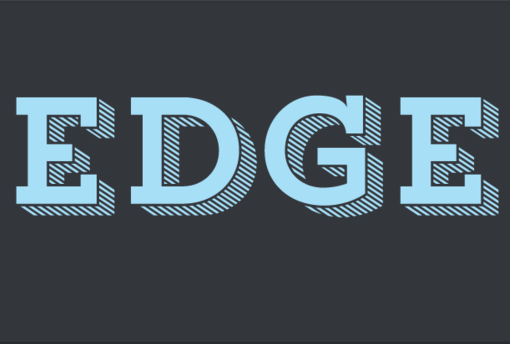 We want EDGE to be a place for undergrads and professors to extend the reach of student work. Usually, once you submit a project for grading, it’s the end of the road. EDGE will be “outward facing,” meaning it’s promoted to those outside GSU as well, so it’s a way to give that work new legs, and to present it to prospective and existing students, alumni, working professionals and who knows who else? Since we’re still in the planning stages, there’s opportunity for fellow SIFers to make suggestions or submit cool undergraduate work that we can use to build a prototype site. The more diverse the types of content we have to play with at the start, the more flexible and effective the magazine will be at launch. If you would like to contribute any of the above for consideration for inclusion, let me or Valerie know! 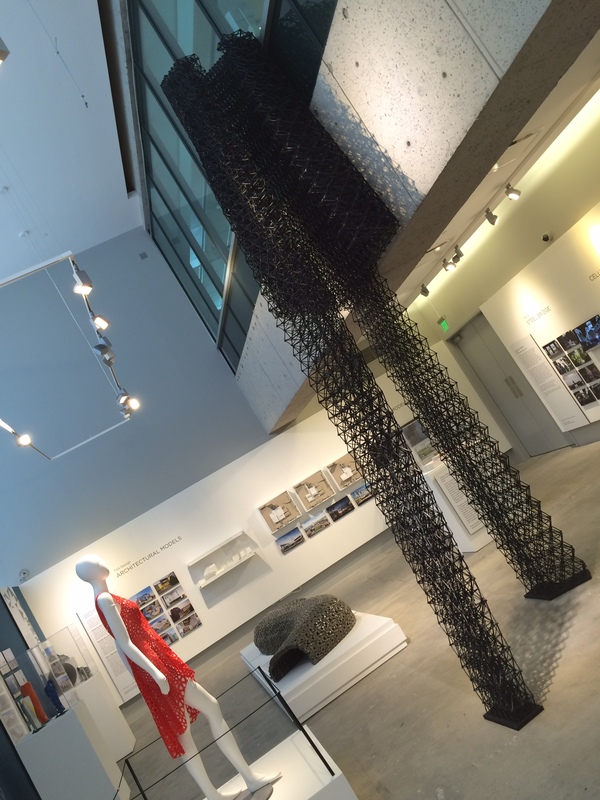 Since the EDGE magazine project is still in the planning stages, I thought I’d start out this semester by talking about an exhibition I saw recently that I highly recommend. Science and medical exhibition room displays everything from 3d printers in space to puppy prosthetics. 3D printing technology and definitions can get highly complex, but as a general primer for the uninitiated, 3D printing is a form of additive manufacturing that creates forms by stacking and binding layers of material from the ground up until the desired form is reached–as opposed to subtractive manufacturing like CNC routers or laser cutters, which removes raw material to create the intended form. In art terms, you could think of it like layering coils of wet clay to form a ceramic pot (additive), versus carving a marble block (subtractive). 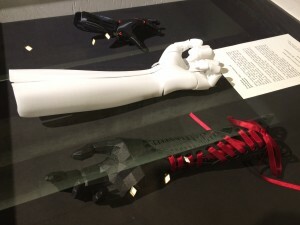 The most common form of 3D printing for the average consumer is called Fused Deposition Modeling (FDM) and is analogous to a computerized hot glue gun. 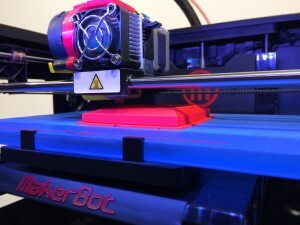 This is the Makerbot you might have heard about, and most of the printers at GSU. A digital 3d model is sliced by software into lots of very small layers, which are then sent as instructions to the printer. Plastic filament in spools of (typically) plant-based PLA or petrol-based ABS (though many new materials are emerging, like brick, wood, metal and even pancake batter), is pushed through a heating element to its melting point, then extruded through a nozzle onto a build platform. The nozzle then moves up slightly, and repeats the process, continuing until the object is complete. A crucial requirement for 3D-printing material is that it cools quickly enough that by the time the nozzle is finished extruding its layer and moves up to the next, it can support the layers above. 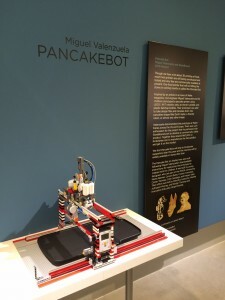 Pancakebot extrudes batter onto a hotplate for custom pancakes. 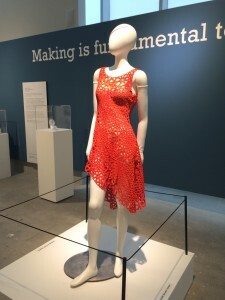 MoDA has dedicated two rooms and a hallway to the exhibit, with gobs of informational text and video that showcase examples of 3D printing in several areas, including space exploration, medical, architecture, product design, and fashion. The only art-for-art’s-sake display I saw was a short stop-motion animated film by Gilles-Alexandre Deschaud called, Chase Me, where a monochrome ukulele-playing girl is chased by some malevolent blob of nastiness. Hijinks ensue. The film used what’s called replacement animation, where instead of animating a single articulated puppet bit by bit for each frame, character statues were printed whole for every single frame in whatever pose was needed and swapped out each time a new frame was shot, resulting in probably hundreds of individual character figures (the Jack Skellington character from A Nightmare Before Christmas used a combination of puppet and replacement: his body was articulated but 400 unique heads were created to swap in and out each frame to create his facial animation). Several were on display next to a monitor showing the video, including eight slightly-different versions of the girl lined up in a row. I assume from context that this was intended to show all the parts needed to execute an animated walk cycle, but a couple were out of order and listing dangerously close to falling over. This exemplifies a common occurrence throughout the exhibit, where the rough edges start showing through from wear and tear, tarnishing the polish of the initial presentation. I’m surprised everything’s held up as well as it has considering how many kids have gone through the place. There are numerous examples of 3D-printed objects, from DIY prosthetics to a 3D-printed dress to giant (in 3D printing scale) architectural forms and even a desktop bio-printer. 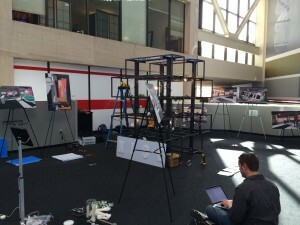 A borg of various brands and kinds of desktop 3D printers were whirring away throughout the exhibit. Some were printing parts for a 3D-printed puzzle-chair, others looked like parts for a prosthetic hand, and others I couldn’t discern at all because they were currently a mess of spaghetti-like strands. An on-site technician was vigorously running around trying to keep up with all the printer failures, and having built and used my own 3D printers, I didn’t envy him his task. 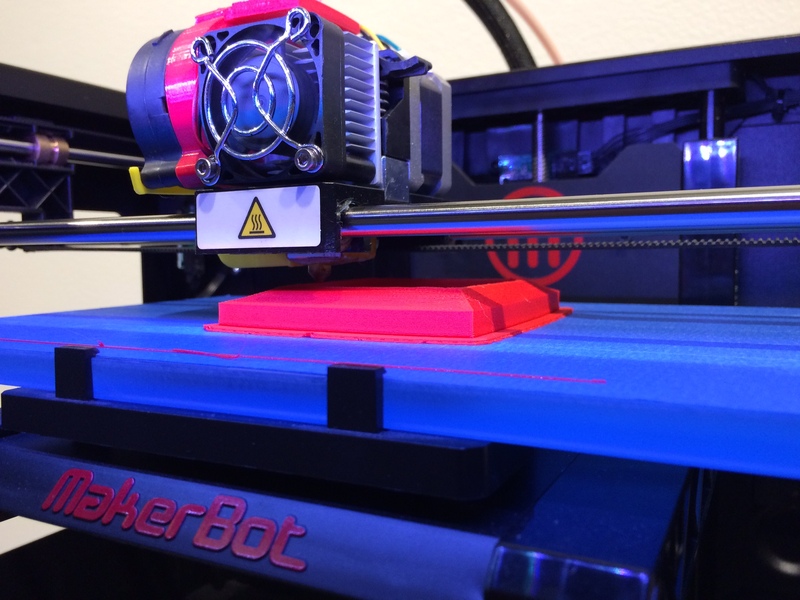 This brings us back to our initial concern: though 3D printers are revolutionizing production, they’re not yet appliances. You don’t have to troubleshoot your toaster, or know how sugars caramelize with heat to create toast. You just put in your bread and out comes delicious and tasty toast. Not so with 3D printing. If toasters were at the technological level of a typical consumer 3D printer, the toast-making process would be much different. First, you’d have to make your own bread. Sure, you could probably find someone who could make the bread for you but if you want true production freedom you need to invest in learning how to make bread in its various forms using specific bread-making tools and techniques–In 3D printing, you can download 3D files that someone else made, but if you want to make your own unique objects, you have to learn 3D CAD software. Next, you have to know how your particular toaster works, and coordinate your toasters heat, time, and spring tension to perfectly match your particular piece of bread’s chemistry. Get something wrong and you have to toss your ruined bread and start over–In 3D printing, each material melts at specific temperatures, and even the dyes used in plastic filament can cause the heat requirement to vary by degrees. Get the temperature wrong and your print is ruined. Then, once you’ve got your bread’s protein chemistry and your toaster’s electronic settings synced up, you’re ready to toast. Insert slice, push lever. But you can’t leave yet. Oh no. You have to sit there and watch the toaster start toasting for at least the first cycle, otherwise the bread could get jammed, or fall out of the toaster entirely, or decompose into its component parts–In 3D printing, the first layer is crucial, if it doesn’t go well, the rest of the print likely won’t either, and you’ll have to start over. Or, sometimes the print gets unstuck from the print bed, and you can’t just put it back on and continue where you left off, you have to start over and toss the ruined print. Now that you’re sure your everything is running smoothly, you can let the toaster toast that yummy bread and go do something else. For 3-20 hours. Or more–it’s called rapid prototyping, but “rapid” is a very relative term. Oh, and at any point during the toasting process, your toaster might screw up your bread, and you have to toss it and start over, but not before troubleshooting and repairing your toaster yourself. Good luck on the forums. Don’t let me nightmare toaster story deter you from the potential and wonderfulness that is 3D printing. Manufacturers are getting closer and closer to that appliance stage, so it won’t be long before we all have desktop 3D printers in our homes next to our toasters and inkjet printers. 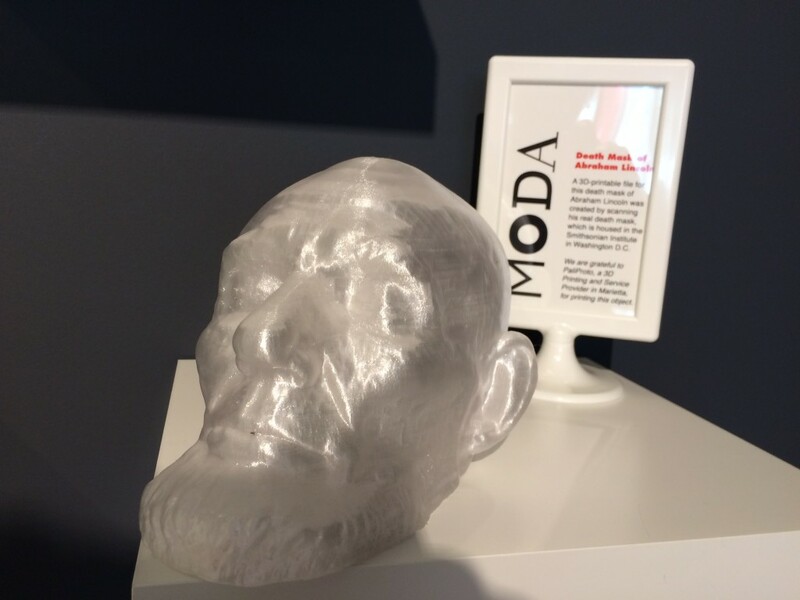 MoDA has presented an almost-comprehensive survey of 3D printing; I would have liked to have seen more examples of purely artistic uses of 3D printers, but regardless, Designers, Makers, Users: 3D Printing the Future is a must see for all ages and levels of technical savvy. SIF Status Check – How’s It Going? How Could It Be Going? Since early fall 2014 I’ve been working on a data-driven sculpture for HLN called “#nicehashtag” that is now installed in the CNN World Headquarters in here in Atlanta (if you take the Inside CNN tour you’ll see it outside Studio 7). 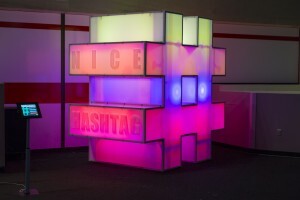 Programmable Hue bulbs change color to reflect realtime sentiment analysis of Twitter. The algorithm accesses Twitter every few seconds and pulls the most recent tweet into its program, determines whether the tweet is positive, neutral, or negative, then compares it to previous tweets and converts it into a percentage that it stores in memory. When that percentage reaches a certain threshold, the color changes. 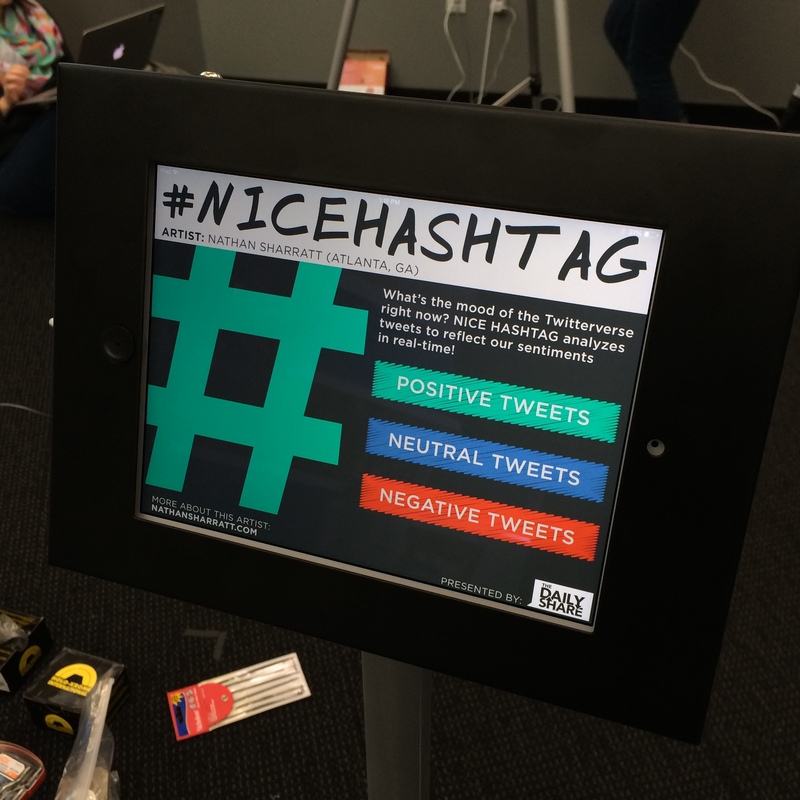 #nicehashtag digital signage explains the project and color coding for viewers. My goal with this project was to consider how we use technology to interact with each other, and how that affects our emotional connections. Screens have enhanced and expanded our communication capabilities enormously, but there are still concerns about what it does to our ability to empathize with others. 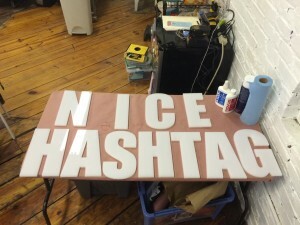 #nicehashtag is a physical representation of internet emotion, at least within the Twitterverse. The challenge with any technologically-enhanced artwork is that the novelty of the tech will overpower the concept that (hopefully) supports it. Using tech in art just because it’s there is seductive but also dangerous for the above reason. 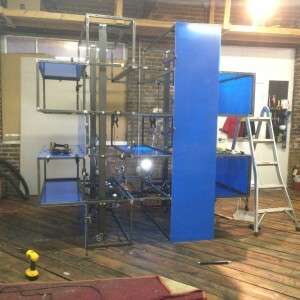 The frame is steel, the blue is the protective film on the white acrylic. In the thick of production. 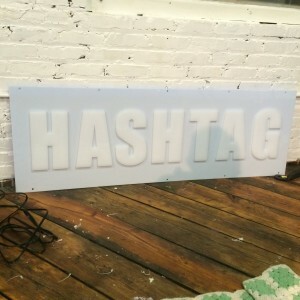 The “hashtag” panel with letters glued on. 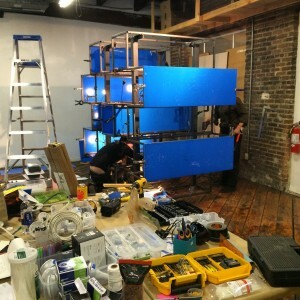 The front vertical panels are the largest sections, at 8′ high. 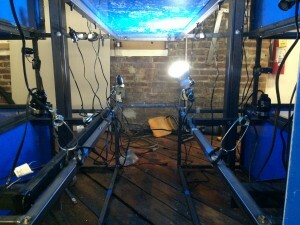 The lights were attached with simple worklamp clamps. 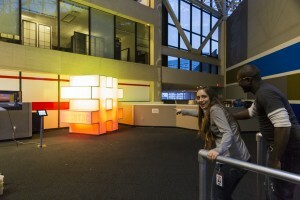 Designing the optimal placement was a challenge to get the most even lighting. 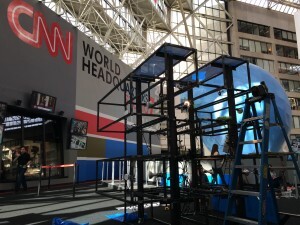 After two all-nighters, we got the frame to CNN. 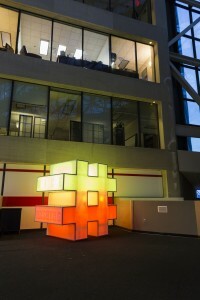 Installing outside Studio 7, with programmer Miles working on debugging the code. 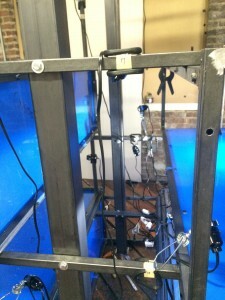 The lights are broken up into 5 rows, controlled separately. 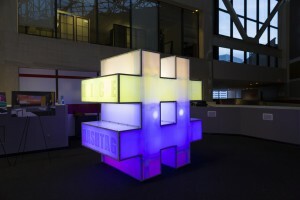 Here, we tested the lights by setting rows of lights to different colors. The final sculpture in positive/neutral state. To continue from my previous post, I’ve been working on artwork that explores the relationships between craft and art as viewed through modern technological tools, specifically 3D-scanning and -Printing, and what that means in terms of gender roles and identity. 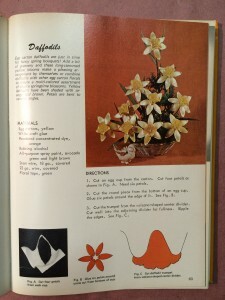 I’m choosing vintage craft books and executing the “creative” projects they contain in step by step instructions, but substituting computers and digital production methods for scissors and glue. 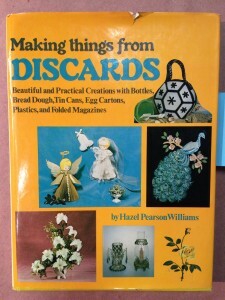 My first project comes from the book, Making Things From Discards by Hazel Pearson Williams, first published in the mid-1960s. 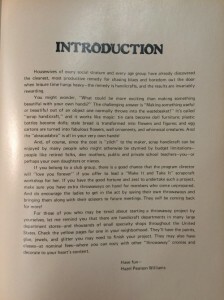 The book was targeted toward “housewives,” and indeed the introduction page is rife with outdated attitudes toward labor and gender roles, placing an excess of leisure time as a primary obstacle to be overcome through craftwork. This got me thinking about what type of craft is socially acceptable for each gender to assume as their leisure work, both then and now. How have these attitudes changed, or have they? 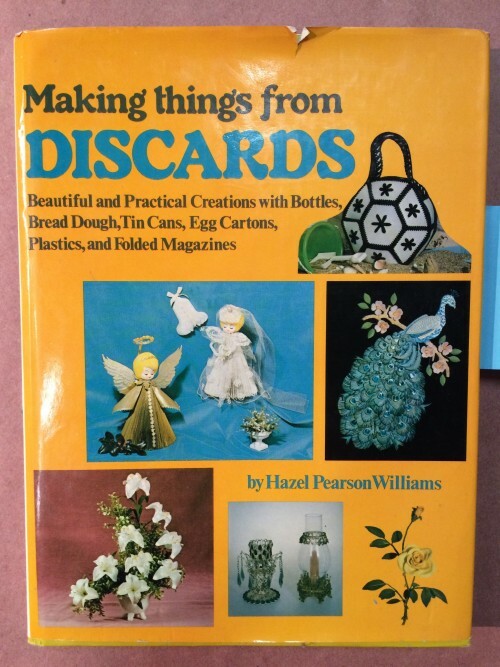 In the mid- to late-20th century, women, as this book illustrates, can be seen to acceptably occupy themselves with what to me seems like “soft” craft: sewing, knitting, scrapbooking, floral arranging, etc. While men are confined to “hard” craft: woodworking, metalsmithing, automotive repair, etc. Women decorate; men build. These social attitudes are built upon the notion that women are somehow less than men, inherently. For a man to perform a woman’s craft or work is seen as being “unmanly,” and confers a lesser status upon that man (again according to prevailing social mores). Conversely, women are seen to be physically less able to perform “hard” craft, due to their apparently delicate nature, lack of physical strength, or some other such justification. While some work does indeed require a certain amount of strength to perform, and may eliminate some less-strong women from performing, that work would also eliminate less-strong men, and shows that cultural, not physical forces, are at work. Moving into the modern era (though not limited to it) I see less of a gender binary in many areas, but ones that seem to hang on are those associated with STEM (science, technology, engineering, math) fields, which are still predominantly male. In my research into 3D printing and scanning, the vast majority of makers and tinkers are male. Being a male myself I seem to fall into this demographic as well, though I don’t ascribe to any belief that women are less in any way, nor that doing traditional “women’s” work somehow lessens my or anyone else’s status. For the purposes of making this art, I’ll assume the role of a man creating craft intended for 1960s women using technology intended for everyone but still dominated by men. I’ll follow the instructions in the above craft book (the paradox of being creative by following exact instructions is also something I’m exploring) starting with the traditional material, in this case foam egg cartons and meat trays, but I’ll import those materials into the computer using a 3D scanner, then manipulate those “raw” materials in a 3D modeling program to execute the steps prescribed in the book, ultimately 3D printing the result. 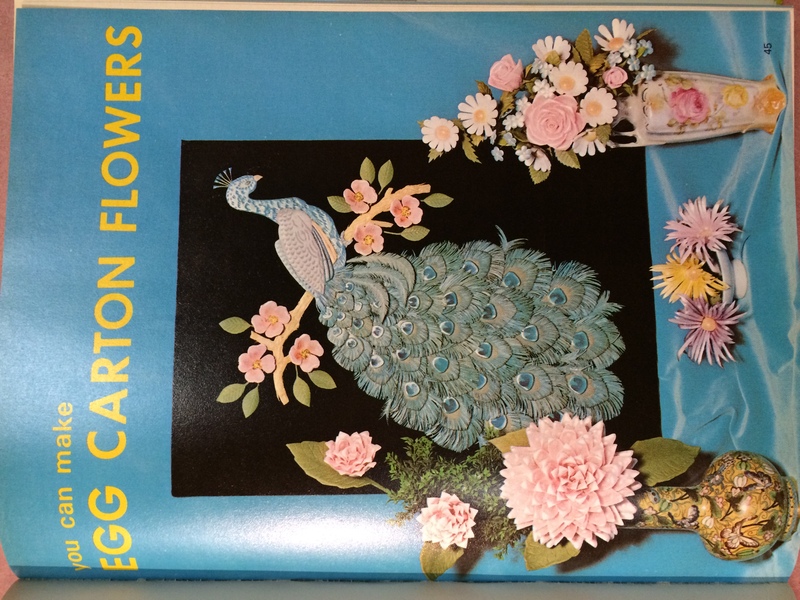 Eventually, I’ll create something (hopefully) as wonderful as this egg-carton peacock, shown above. 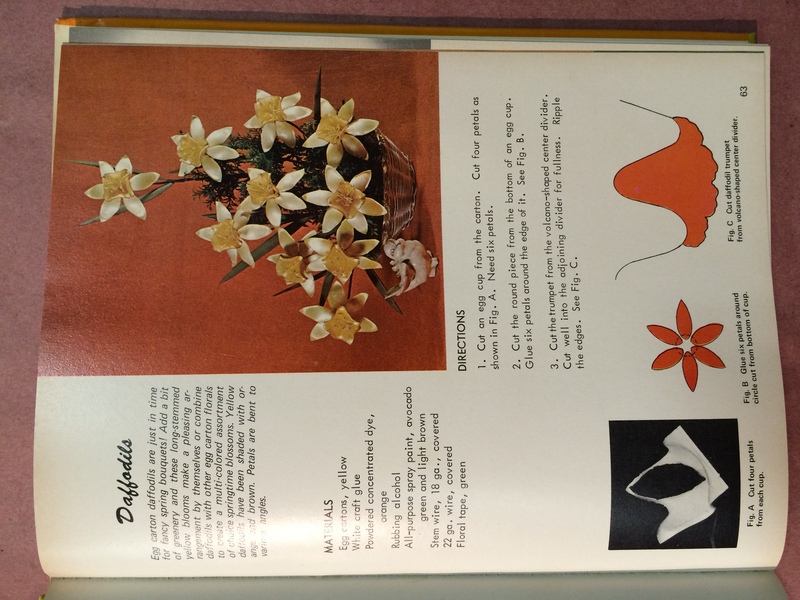 I’ll make something a little less complex to start, like a daffodil flower. Now that I have my project, I started by experimenting with ways to scan my egg carton using an Xbox Kinect sensor, below I tried hanging it from filament line. Here, you can see the raw scanning data when I had the carton on a table. Green is good scan data, red is bad data. 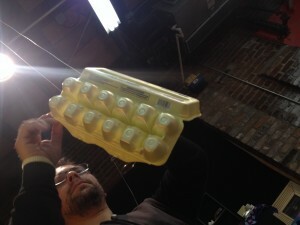 Egg Carton 3D-Scan Data. And here is one of the first final models 3D-Scanned Egg Carton Mesh. Next step is building the flower! 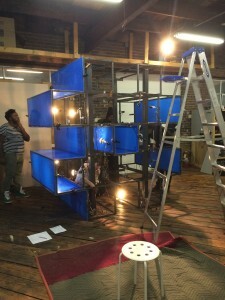 With the goal of bringing interdisciplinary, data-driven tools to artists, my first step is to learn the tech myself and to create proof-of-concept artworks as demonstration examples, and then lead workshops for interested artist students about how they can use these tools in their own artistic practice. 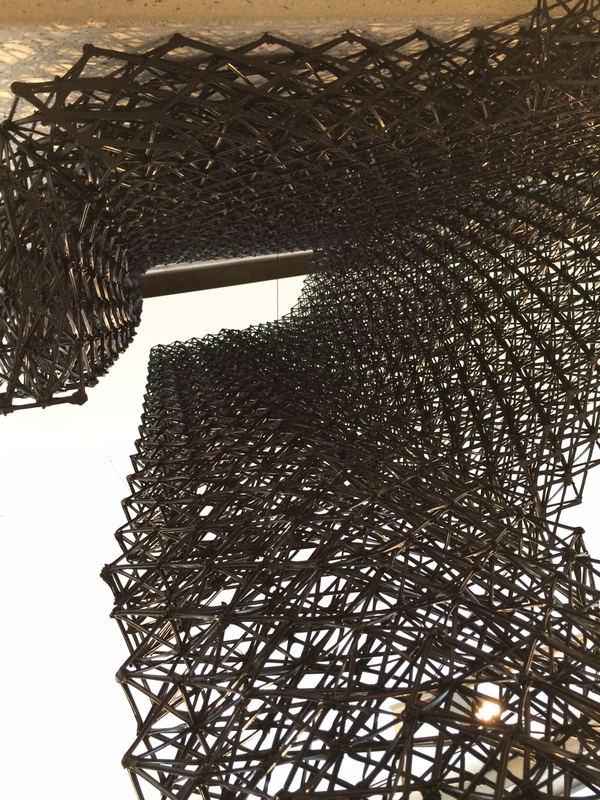 My first tech exploration is the process of 3D photometric scanning using Agisoft Photoscan, and then 3D print a sculpture based on manipulations of that scan. I thought this would be a good transition tech for artists since it is so visual and deals with real-world applications where big-data and similar tech seem abstract and untouchable (at first). My first artwork will conceptually explore how 3D printing and scanning fit into the art/craft dialectic and how gender roles are defined. Traditionally, “craft” has been assigned primarily to the female gender, especially decorative and soft-material crafts like embroidering or floral arranging. Men have engendered hard craft, using materials like wood and metal that have practical uses. With the advent of at-home production using complex and technical 3D printers, men have traditionally dominated the genre for whatever reason. 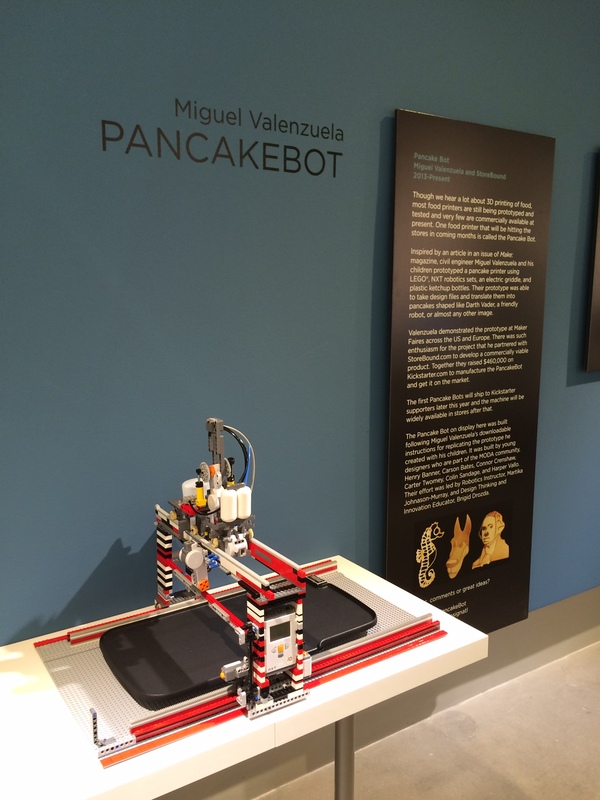 Now, in a role reversal, 3D printers on the consumer level are overwhelmingly known to create either parts for building and engineering, or decorative trinkets and gadgets. 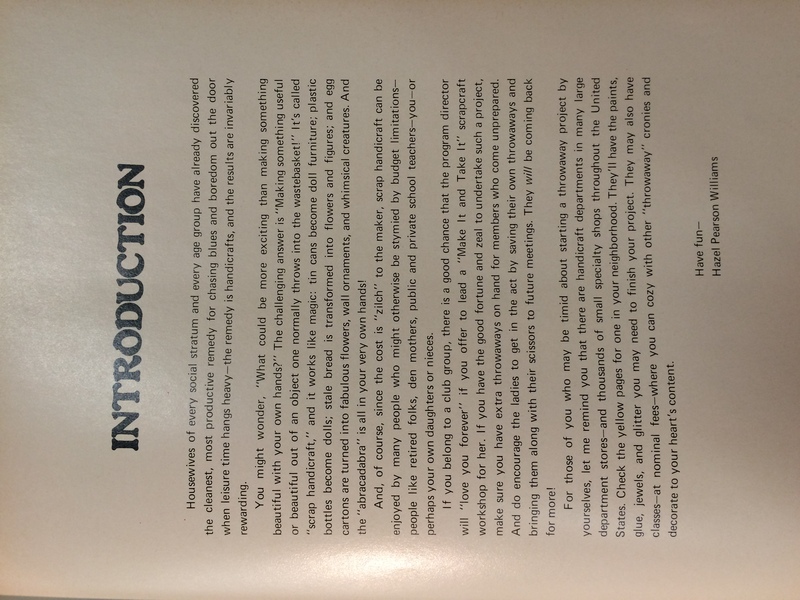 Using a craftbook from the 1970s written specifically for “housewives with leisure time,” I’ll recreate one of the projects using new technology. Specifically, I’ll 3D scan a foam egg carton, then in the computer attempt to use the virtual modeling tools as if they were real-world tools to follow the steps in the book to create a decorative peacock. The result will be 3D printed and highlight the mutations that occur from multiple role transpositions and translations. Future posts will outline the process. desy on SIF Status Check – How’s It Going? How Could It Be Going? Nathan Sharratt on SIF Status Check – How’s It Going? How Could It Be Going?